Dual Independent Servo Drives Keep High Parallelism of Slide, to Further Improve Productivity and Accuracy. Free motion extends possibility of the press. 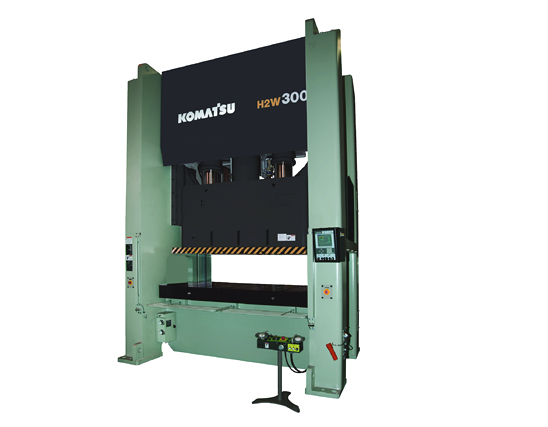 Equipped with the dual servo, the H2W type press satisfies the important three requirements for press forming (high productivity, high formability and high precision), which will enhance users' utmost benefit. Combining the dual independent drive mechanism with the servo control systems, the press attains high accuracy forming. Reduced slide speed for higher formability reduces whole cycle speed to lower productivity with a mechanical press. With a mechanical press, reduced slide speed for higher formability reduces flywheel speed that accumulates energy and lowers workload, which can be insufficient for such forming as deep drawing that requires large work load. Free motion makes formability compatible with productivity by one machine. It creates enough work load for deep drawing. Production speed is the same as or faster than that of our mechanical presses! The most suitable motion setting for each product can be applied with the free motion. Slide motions are set to meet each forming product using the free motion on the servo press, which makes formability and productivity compatible with each other by so setting that slide moves slow only in the range where formability is required. With the S specification, still higher productivity can be achieved by setting stroke length of pendulum motion at the smallest for the product. Enough workload for deep drawing can be secured with the dual servo motors and isn't lowered by changing slide motions. The press can create high workload (energy) regardless of production speed. Since workload isn't lowered by reducing slide speed for better formability, deep drawing products that were unable with conventional mechanical presses can be formed. "Auto BDC Correction""Auto Load Compensation"
Doesn't product accuracy variate after some time? Surrounding temperature change and heat generated in the press/dies make dimensions of the press/dies change, and eventually affect product accuracy. Such effect can be made minimal in a constant temperature room, but cannot be expected in many ordinary production sites. We suppose, at many production sites, you are taking care, upon experiences, to secure acceptable products by stopping operation to adjust die height periodically and by increasing frequency of sampling inspection. Correction function based on measurement dissolves product accuracy variation. 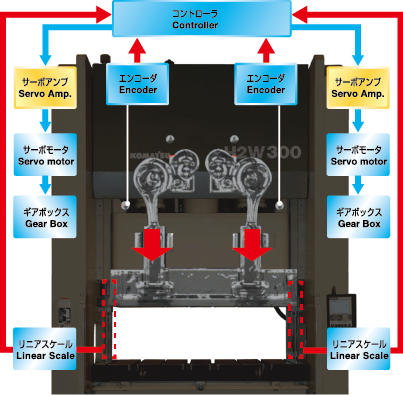 This is Komatsu's own technology to control slide position automatically based on actual slide position measured by the linear scale and actual forming load measured by the load meter. Frequency of die height adjustment and inspection can be reduced. 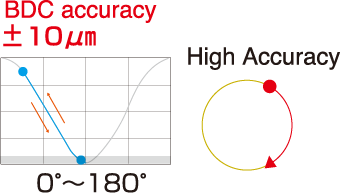 High accuracy of bottom dead center can be maintained by offsetting its variation to be in a certain range. 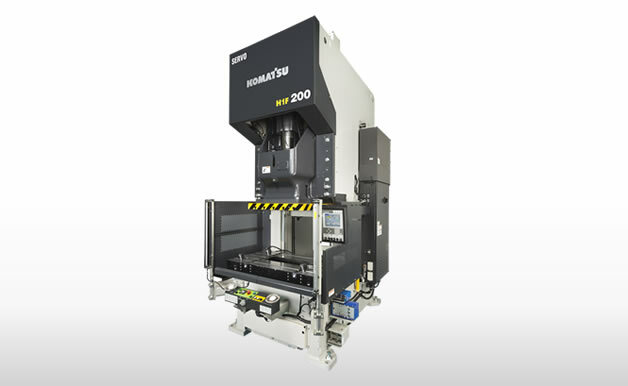 Maintain BDC position accuracy within 20μm In either direction from desired position. Stable and high accuracy forming can be maintained by offsetting variation of the largest load to be in a certain range. Maintain load balance no more than 10kN In either direction from desired amount. Reverse motion with independent dual axes makes "ultra-high" accuracy forming possible. Use reverse motion for such products as half blanking that require more precise bottom dead center accuracy. Installing with the dual independent axes of servo drives, and with the full-closed feedback control that makes the slide reverse before reaching bottom dead center based on the slide position measurement by the linear scale, "ultra-high" accuracy forming can be achieved with H2W by precisely reaching bottom dead center every time. It is highly accurate in parallelism also. 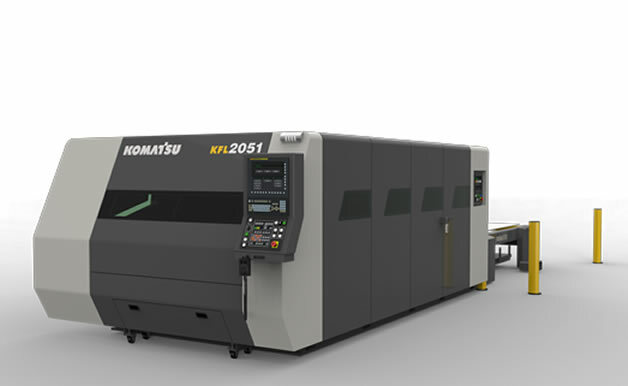 From Morio Press Industries, Ltd.
We were interested in the control with dual independent servo motors on the Komatsu's original two point press. 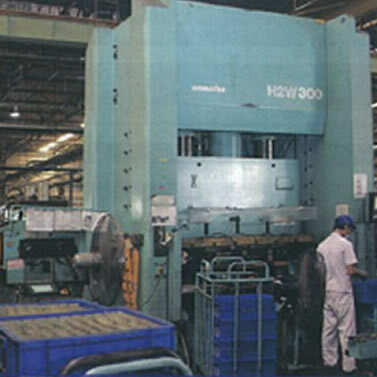 Stroke of previous 150ton press by other maker was 130 mm and had a limit in formable products. 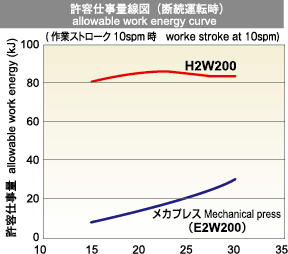 The standard stroke of of our new H2W200 (S specification) is 250 mm. And knowing that short stroke forming is possible without reducing SPM utilizing the pendulum motion, we will use it as a more versatile machine. 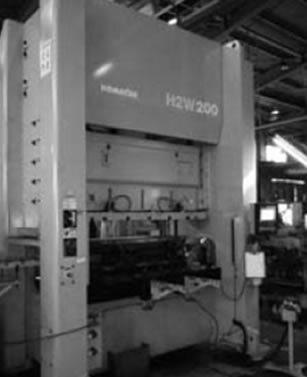 We have greatly reduced number of work stages with "press forming" using a servo press in manufacturing such products as many machine works were required and as were ever produced with forging. 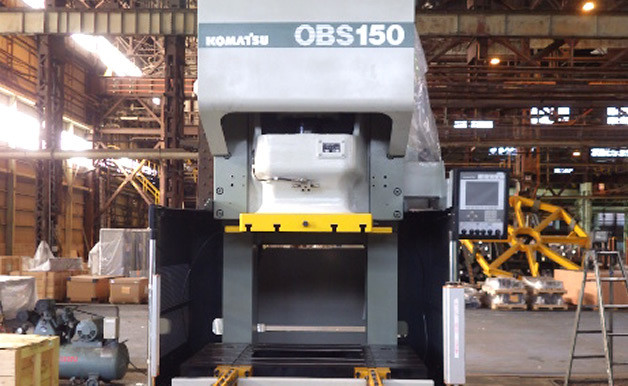 We have been using Komatsu servo presses for five years and have never had a problem of product quality. We are now highly appreciated by clients.